Dog kennels have improved quite a bit over the past few years. Today nearly 50 percent of the people in America have pets and most consider them family. Because of this and the fact that the babyboomers are in traveling mode, means dog kennels had to become more pet- and person-friendly. If you’ve never left your pooch in a dog kennel, the experience can be intimidating at first. That said, if you choose the right kennel, it can be the time of your pet’s life! So your choice should not be whether to leave your pooch in a dog kennel or not, but which one. Vacation Pet Friendly has the largest number of listings for thousands of dog kennels. Our listings expand through the United States. Dog sitters are great for a day. But if you have to leave your dog overnight, even if it is in the comfort of your own home, dog kennels are a better alternative. Just make sure to do your homework first. Once you decide to leave your dog in a kennel, keep in mind that they can be a great experience for your pooch. First, dog kennels ensure your pup will have the companionship of people and other friendly dogs. Staff members often are experts in dog handling and care, and will be able to engage your pet and know what it takes to keep your pooch happy. Many kennels nowadays, can keep you apprised of your dog’s status via cameras, so you can check up on your pup with your own eyes anytime you like. A lot of travelers use dog kennels for those times when they need to spend time at places without pets. Read this article on kennel trends. If you’ve never left your dog in a kennel before, ask your friends if they can recommend one. If not, check out our listings and start calling. Ask questions. Make sure the kennel offers everything your pet will need to make him comfortable and feel loved while you are away. Listings of Dog Kennels in the U.S.
Not convinced yet? Check out our listings for kennels near you in every Travel Guide. We provide active links, making it that much easier for you to call them up and ask all the questions you like. You also may want to check out Dog Hotels. While they are a bit more extravagant in amenities and pricing, you may find one that you really like. 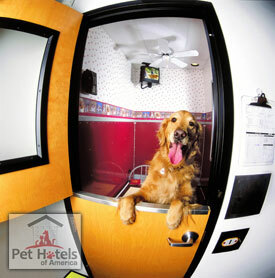 Read this for more information on Dog Hotels. Did she get along with other pooches? How long did it take her to adjust to the new environment? Did she make friends easily?